Dandruff, known medically as sebhorreic dermatitis, causes white flakes of dead skin to shed from the scalp. According to MayoClinic.com, possible causes for dandruff include sensitivity to hair care products, shampooing too frequently or infrequently, eczema, and psoriasis. The most common dandruff treatment is medicated shampoo. However, those who prefer natural home remedies may find that adding crushed aspirin to your shampoo can do the trick. 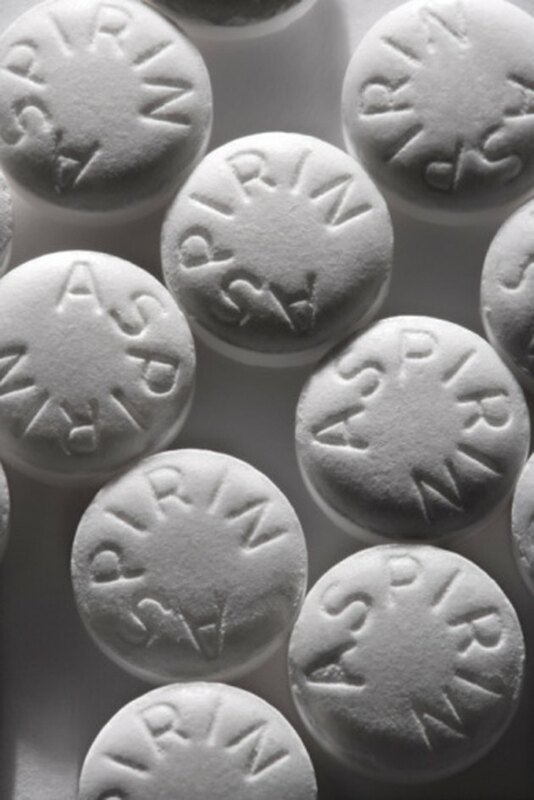 Aspirin contains salicylates, the same active ingredient in medicated shampoos containing salicylic acid. Crush two uncoated aspirin by folding them in a napkin and crushing them with the back of a metal spoon or grinding them in a pill grinder. Pour one capful of shampoo into a bowl. Use a fragrance-free, dye-free shampoo with as few ingredients as possible. Dandruff can be exacerbated by additives such as perfumes and conditioners. Add the aspirin powder to the shampoo. If you use more than a capful of shampoo to wash your hair, adjust the number of aspirin tablets accordingly. Stir the mixture well and use it to wash your hair. Leave it on for at least five minutes to allow the salicylic acid to exfoliate your scalp. Rinse the shampoo thoroughly from your hair and repeat if you wish. You can add 1/2 cup of apple cider vinegar to a pitcher of water and use that for the final rinse for extra dandruff-fighting power. There is no need to wash the vinegar out of your hair; the smell will go away as your hair dries.